NEW YORK (CNS) — Don’t let the title fool you, “Frozen” (Disney) is bursting with enough warmth and charm to defrost even the hardest Grinchy heart. Loosely based on the Hans Christian Anderson fairy tale “The Snow Queen,” this 3-D animated musical is good-natured, overwhelmingly wholesome fare with something for everyone: Broadway-style show tunes, thrilling adventure, gorgeous visuals, cute-as-a-button characters, and a nice message about the enduring bonds of family. There are even a few respectful religious overtones likely to please believers. “Frozen” is a tale of two princesses: Elsa (voice of Idina Menzel) and Anna (voice of Kristen Bell). Anna is fun-loving and spirited, while Elsa, destined to be queen of the mythical kingdom of Arendelle, is reserved, harboring a deep secret. Elsa, it seems, was born with the power to create ice and snow at will. This gift was great fun at playtime when she was a youngster. At least, that is, until Elsa nearly killed Anna in a freak accident. The king (voice of Maurice LaMarche) then decreed Elsa must be hidden away for her own safety, and the palace closed to all outsiders. Eventually, the princesses become orphans (parents rarely seem to survive in Disney cartoons), and coronation day arrives for Elsa. The new queen is burdened by fears of a disaster; Anna, by contrast, revels in the overdue arrival of an open-door policy. 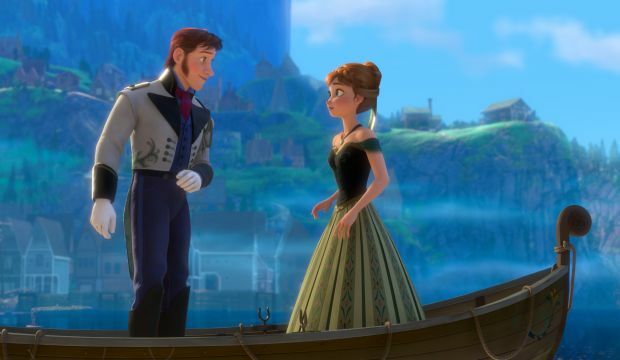 At the coronation ball, Anna falls fast for Hans (voice of Santino Fontana), a visiting prince, and after a spirited song-and-dance number, they announce their engagement. Queen Elsa won’t give her blessing — the two have just met, after all — and the sisters quarrel. Elsa accidently unleashes her powers and throws Arendelle into a deep freeze. For everyone’s welfare, Elsa retreats to the forest, entombing herself in a mountaintop ice palace. Anna, the fearless optimist, follows her, desperate to help her sibling and undo the eternal winter. Joining her odyssey is Kristoff (voice of Jonathan Groff), an amiable mountain man, and his silent reindeer sidekick, Sven. Together, they encounter a comedic snowman named Olaf (voice of Josh Gad), who knows the express route to Elsa’s hideaway. Amid Everest-like conditions, and with an abominable snowman and an adorable bunch of trolls thrown into the mix, the sisters head toward an epic showdown. Directors Chris Buck (“Tarzan”) and Jennifer Lee (who also wrote the screenplay) keep the pace fast and the action lively. Some of the storm sequences may be a bit intense for the youngest viewers, but it is all in good fun. Preceding “Frozen” is an animated short film, “Get a Horse!” — a clever and funny re-creation of a classic Mickey Mouse cartoon, directed by Lauren MacMullan. The film contains a few mildly perilous situations and a bit of slightly gross humor. The Catholic News Service classification is A-I — general patronage. The Motion Picture Association of America rating is PG — parental guidance suggested. Some material may not be suitable for children.